If you’re a regular reader of The Leipzig Glocal, the new face you’ll see tomorrow when you wake up and go for your morning (or afternoon?) dose of glocalness may look very nice but very different from what you’re used to. We hope we have injected it in all the right places to enhance your viewing and browsing experience, but are still in the process of tweaking the new design and organization, and making it fully responsive to and ideal for different types of devices – computer, tablet, mobile. So we’d appreciate your feedback! LeipGlo’s new layout: Implementation led by Marina Renault, assisted by maeshelle west-davies. Under “My Leipzig” up top, you’ll find, as the title suggests, many of our local pages: Jobs for International People, English-Speaking Doctors (under “Community), info and insights regarding different aspects of the Leipzig scene and city life. “What’s On” will give you Leipzig Events, plus Openings and Premieres and FUNkyFRIdayz mixes. 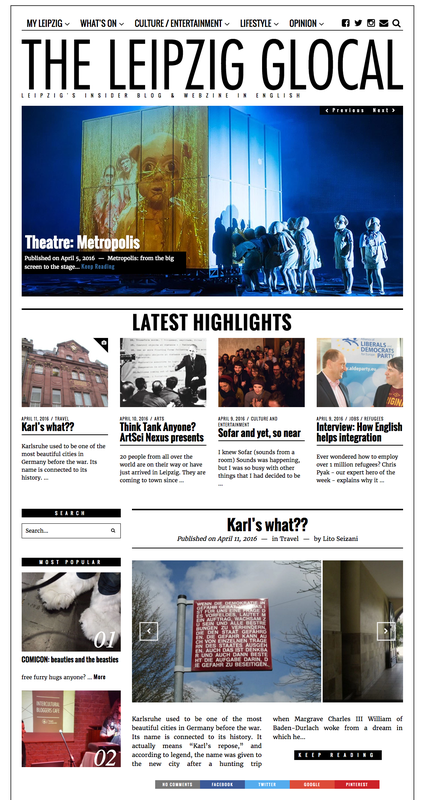 You will be able to find our weekly showtimes for movies in the original (“OmU”), plus the Free Museum Days listing, under the next tab, “Culture / Entertainment;” it will also house all the other arts- and entertainment-related columns, including literature, music and performance and movie reviews. Travel, Dating, Food, etc. will be under “Lifestyle,” while “Opinion” will be the domain of Politics and related topics. There will be some overlap, meaning you’ll see some articles under more than one category. It’s similar on mobile, of course; just click on “Menu” and go from there. I’ll leave the rest for you to click around and explore – in fact, the LeipGlo team is doing the same, learning as we go along, and knowing there’s always room to make it better. Previous Story Previous post: Karl’s what? ?